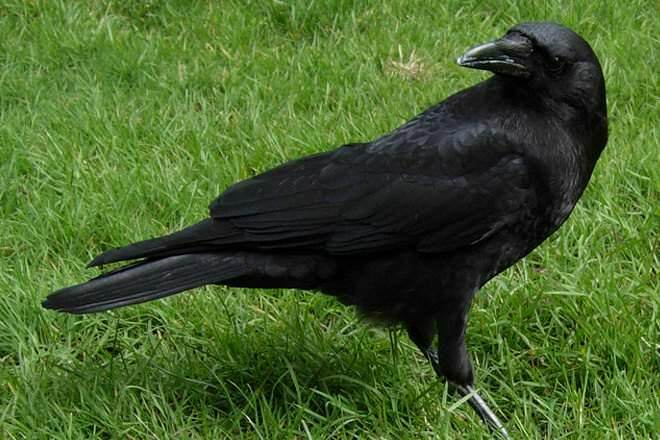 While crows and ravens may look similar and are both highly intelligent birds, they are very different in their behavior, habitat and even have physical characteristics that clearly distinguish them from one another. Smaller and flat. There is no tuft of hair atop the bill. Bigger, more powerful and curved. There is a tuft of hair atop the bill. Ravens are larger than crows. So they are longer, weigh more and have greater wingspan. When in flight their necks appear longer than that of a crow. The bill of a raven is also larger. Crows tend to fluff their feathers into a mane and when a raven fluffs up its breast it looks ragged. The tails are also prominently different and this can be seen clearly when these birds are flying. Ravens have pointed wings and wedge-shaped tails but crows have blunt and splayed wings and fan-shaped tails. Crows generally make the ‘Kaw’ sound in discrete units. A loud Kaw followed by a series of short Kaws. It is high pitched and nasal; crows are louder and have a harsher sound. A raven has deeper and less piercing sound. Their calls may sound like "croooaaak", "gronk- gronk", "tok", and "wonk-wonk." Crows are very intelligent and are known to devise ingenious ways of getting food and surviving in urbanized environments. In a study published in July 2014, researchers found that for certain cause-and-effect water displacement tasks (like The Crow and the Pitcher story in Aesop's Fables), crows can perform as well as 7- to 10-year-old humans. In fact, crows can form special relationships with humans who feed them consistently. As an example, crows have been known to bring little trinkets as gifts for this family in Seattle. Crows also have the ability to recognize and remember people by their faces. The Nature documentary The Murder of Crows (YouTube) is a great film for those interested in learning more about this extraordinary bird. This video, shot in Canada, demonstrates the intelligence of ravens. There are at least two known species of crows that use tools: the New Caledonian crow and the Hawaiian crow. New Caledonian crows are even known to care for their tools and make new tools by bending straight pieces of garden wire into hooked foraging tools. In a recent experiment, 93% of adult Hawaiian crows in captivity were able to find and use a stick to scrape meat out of logs with tiny holes. They had never done this before and it was a novel situation that they adapted to, using sticks as tools. 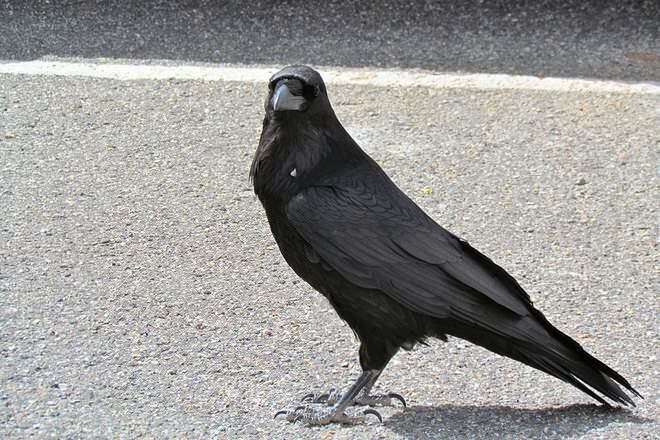 Ravens thrive on small invertebrates, amphibians, reptiles, small mammals, birds, cattle/sheep carrion, human garbage. Crows prefer birds, fruits, nuts, mollusks, earthworms, seeds, frogs, eggs, nestlings, mice and carrion. Crows are associated with war and death in Irish mythology. In Cornish folklore crows are associated with the "otherworld" and so must be treated with respect. In Australian Aboriginal mythology, the crow is an ancestral being. In Buddhism the protector of the Dharma is represented by a crow in one of his physical/earthly forms. The raven is revered as god by the indigenous peoples of the Pacific Northwest in North America and in northeast Asia. 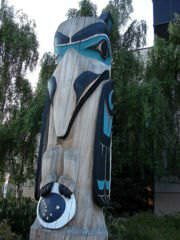 Several totem poles erected by native Americans in Washington, Alaska and Oregon depict ravens and the stories they feature in. In the Old Testament of the Bible there are several references to common Ravens. In the British Isles, ravens were symbolic to the Celts. In Irish mythology, the goddess Morrígan alighted on the hero Cú Chulainn's shoulder in the form of a raven after his death. Ravens also spend a lot of time soaring like hawks. Crows will sometimes glide, but never soar.